Perusahaan Umum Lembaga Penyelenggara Pelayanan Navigasi Penerbangan Indonesia - Perum LPPNPI more popularly called "AirNav Indonesia" is an Indonesian state-owned enterprises (BUMN) that is involved in the field of air navigation services. AirNav Indonesia operates primarily as a single operator of air navigation services in Indonesia. AirNav Indonesia has 4,110,752 km² of air space which is divided into 2 Flight Information Regions (FIR), namely Jakarta FIR and Ujung Pandang FIR. According to AirNav Indonesia's company profile as cited by JobsCDC.com, AirNav Indonesia was formed by the Government of Indonesia in 2012 as merger results of 3 main air traffic services (ATS) providers, namely ATS Angkasa Pura I, ATS Angkasa Pura II and Government Operated ATS. 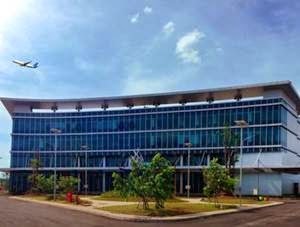 Headquartered in Tangerang Banten, AirNav Indonesia runs its business through 20 districts offices spread in 8 branches nationwide, namely JATSC Branch, Medan Branch, Palembang Branch, MATSC Branch, Surabaya Branch, Denpasar Brancd, Balikpapan Branch and Jayapura Branch. Male/Female, not older than 35 years of age. Possess a minimum cumulative GPA of 2.75 on a 4.00 grade scale. Have a good health (physically and mentally), drug-free, no disability, no tattoos, no pierced (for Male) and not color blind. Willing to be placed in all working area of AirNav Indonesia in all over Indonesia. Not in the bond department in government and private agencies. Possess license or personnel expertise certification issued by regulator. Minimum age of 21 years for Pemandu Lalu Lintas Udara. Possess STKP certification (Sertifikat Tanda Kecakapan Personil) or Surat Keterangan Lisensi Sementara issued by regulator. JobsCDC.com now available on android device. Download now on Google Play here. Please be aware of recruitment fraud. The entire stage of this selection process is free of charge. Perum LPPNPI - Air Traffic Guide, Aeronautics AirNav Indonesia April 2017 will never ask for fees or upfront payments for any purposes during the recruitment process such as transportation and accommodation.